The floats told the story of Le Bonheur Children’s Hospital on Tuesday as it celebrated its 58th birthday with the opening celebration for a new $340 million pediatric medical center. A giant heart with stitches symbolized the giving spirit of the Le Bonheur Club, the ladies sewing club that led the effort to build the old hospital. Another float featured huge hard hats in tribute to the construction workers who built the new one. 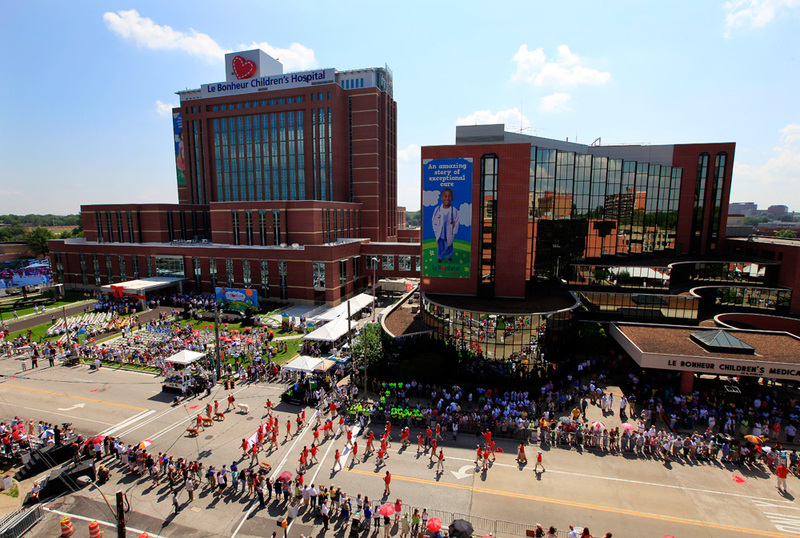 After the parade, Meri Armour, the hospital’s chief executive officer, stood on a podium in bright sunshine and compared Le Bonheur to a well-loved child. The hospital was built with the support of the largest fundraising campaign in the city’s history. More than $100 million of the money to build the hospital came from donations. The 255-bed hospital is estimated to have a $3.7 billion economic impact on the Memphis area over a five-year period. It is also a new anchor for the Memphis Medical Center on a stretch of Poplar Avenue that is now being revitalized. Gary Shorb, the chief executive officer of Methodist Le Bonheur Healthcare, introduced videotaped remarks from Gov. Phil Bredesen. Memphis Mayor A C Wharton Jr. and interim Shelby County Mayor Joe Ford also spoke. Ford related a personal story about how physicians there had successfully diagnosed and treated his son, a young man who is now in medical school. Medical experts had initially thought he had a tumor in his jaw and were about to do surgery when a doctor at the hospital diagnosed the problem as abscessed bone. The people in the audience had their own family stories. Ann E. Willis, 84, brought her children and grandchildren to the ceremony. She told The Daily News how Dr. Jack Segal did a tonsillectomy on her son at a time when the hospital was segregated. In later years, Willis would become a member of the board of trustees for the hospital and for its foundation. She laughed as she remembered how her granddaughter, Alexandra Willis, who is now 23, was treated at the hospital when she swallowed a penny as a little girl. The parade featured dozens of children who have been successfully treated at Le Bonheur, including three grand marshals: Olivia “Livi” Jones, Reese Wagner and Chandler “Chance” Futrell. underwent 13 surgeries at the hospital to save his leg. 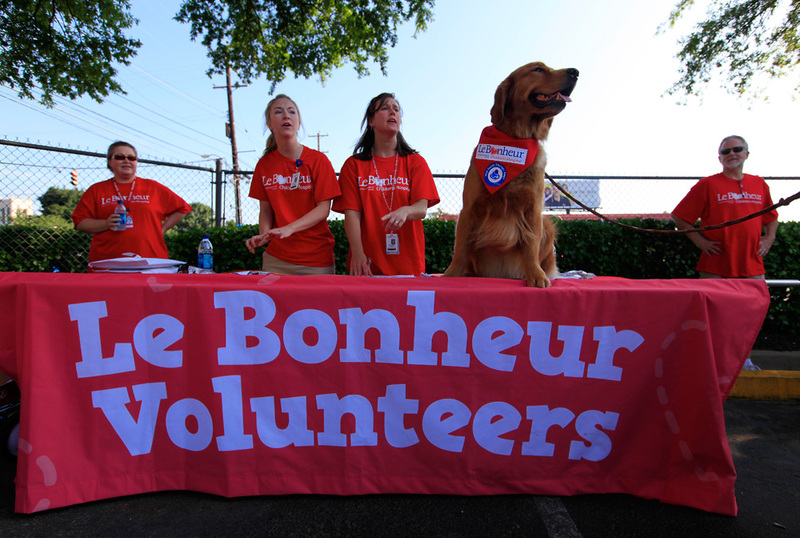 Every year, Le Bonheur treats 130,000 children from across the country. It has one of the nation’s busiest pediatric emergency departments and hosts one of the largest pediatric surgical brain tumor programs. Le Bonheur will begin moving patients from the old hospital into the new hospital in September.